Vivofit Jr. 2 isn’t just a fitness tracker for kids. It’s an interactive experience where activity unlocks adventure. The swim-friendly band features a 1+ year battery life — no recharging necessary. 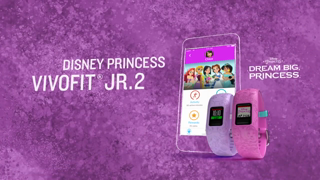 With Vivofit jr. 2, kids can uncover Disney Princess adventures and games on the parent-controlled app by completing 60 minutes of daily activity. While kids explore magical kingdoms with Ariel, Belle, Jasmine, Mulan and Rapunzel, parents can use the app to monitor activity, manage and assign chores and even give rewards to positively enforce good behavior. Bought this about a month ago for my 8yr old, and ya been amazing. Not only have I gained a lot of insight into my child's daily/nightly activities. The watch/app have helped give my son structure and get him to build better habits. Definitely recommend for any parent to buy for their kids. I'm now looking into purchasing my own Garmin fitness watch so we can all compete on the leaderboard. Bought this for my son's birthday and he loves it. He likes to check his steps and how it reminds him to do chores for points. The only downside is I'm having a hard time getting it to sync regularly to my app. So far I've had to disconnect it and resync it each day to get the stats to show up on the app. We got this for your daughter that just turned 8 a few days ago and she loves it. She's having a good time keeping track of her steps and making sure she earns her coins daily. Just wish the screen lit up. That's the only downside. Will probably get one for our son that will be 5. Its help cut back on a lot of "reminding" now she willinging puts away toys to see if she gets a coin". I like how many alarms I can set for her medications. My biggest dislike is she doesn't have to go far before it's no longer synced which is proving to be a pain. I would love to speak with garmin developers on more advanced work on it as it could really benefit my daughter in her medical needs. All in all, it is a good device. I like that they are geared towards children, because my kids would not ever wear a plain one. In fact, that is the main reason we went with the Garmin... that and the fact that the battery does not have to be charged. My 5 year old LOVES his. In fact, he's driving us nuts wanting to know how many steps we have (Hubby and I both have Fitbits, so we can't compete through the apps). It would also be really nice if there was a way for the app to read the instructions, instead of the child having to read them. My 5 year old is fine, but my 3 year old cannot yet read, so she isn't so much in to the app because she doesn't know what's going on. He seems to get around on it fine and we're soon going to start implementing the chore rewards. Other than that, we have been pleased. We got the adjustable band. For my 5 year old (and 3 year old) the smallest setting works fine on the adjustable band. Overall, we've been very pleased!